A firming eye serum to restore youthfulness to aging skin around the eyes. 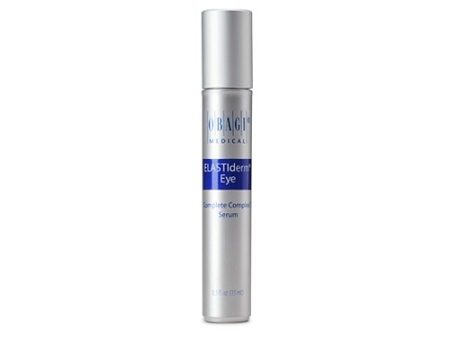 Obagi ELASTIderm Eye Complete Complex Serum revives the delicate skin around the eyes for a rejuvenated appearance. Bi-mineral complex promotes elasticity to tighten and smooth out wrinkles and crow's feet while malonic acid encourages skin cell renewal. Caffeine helps brighten dark under-eye circles and reduces puffiness. Features a rollerball applicator for easy use. Net Weight .47 oz / 14 ml. These statements have not been evaluated by the FDA. These products are not intended to diagnose, treat, cure, or prevent any disease.